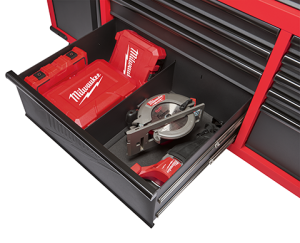 Last year was a pretty big year for Milwaukee when it came to storage solutions as they came out with a couple of portable plastic tool boxes, a storage organizer for small parts, and they’re extreme value packed 46″ rolling steel storage chest and cabinet set. For me the standout storage solution that was offered last year was their 46″ rolling steel storage chest and cabinet set and not because it was their first entry into steel tool boxes, but because of the extreme value they offered. 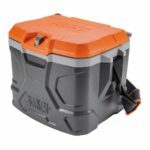 They managed to make moderately sized tool boxes with a ton of features including built in power outlets, built in peg board for the chest, self closing drawers, liners included for each drawer, beefy casters, and upgraded heavy duty construction, and a few out of the box ideas like their oversized power tool drawers with built in compartments to hold individual power tools and batteries, and their neat laptop drawer. Not only did they manage to cram all these features into their steel tool boxes, but they did so at an unheard of value at the time. 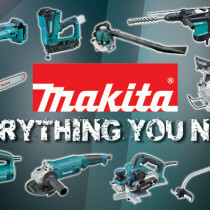 Heck, the value was so good that they were dipping into Harbor Freight pricing. 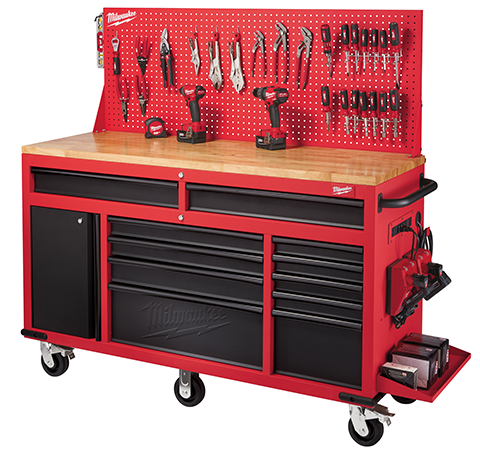 Enough about last years news, this year right now, Milwaukee has just announced a new 30″ storage chest and cabinet set with everything that made last years 46″ rolling steel storage chest and cabinet set a huge hit and also a new 60″ mobile work station. The 30″ steel storage chest and cabinet set is pretty much the “mini me” clone of the larger 46″ set with all of the same features except now it is offered in a smaller 30″ width and has 12 drawers. I feel this is a good direction to go with as not everyone has the space or need for the 46″ set. 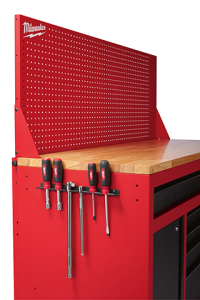 But even though it’s smaller you still gain all of the same features such as the peg board, the power strips, self closing drawers with 100 lbs capacity, power tool dividers, laptop drawer, beefy casters and upgraded heavy duty construction with reinforced angle iron. 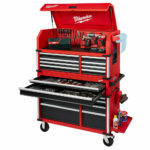 The new 60″ mobile work station takes many of the features and design from the current 46″ rolling steel chest and makes it larger with a 60″ width and this new mobile work station is just like it’s name implies as it is a portable work bench. 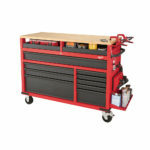 This portable work bench features a reversible 1″ thick hardwood top and just like the 46″ steel storage chest, it also incorporates a built in peg board. 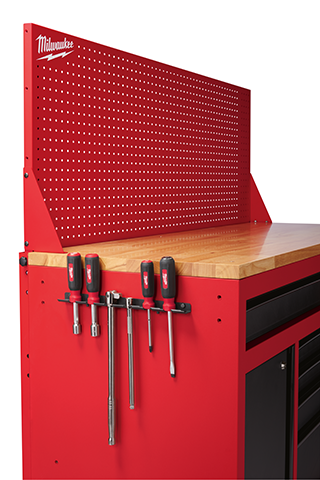 The peg board is oversized with a 22″ height and in my opinion mimics a back wall where you can store your tools, but the backwall is mobile because the workbench is mobile. 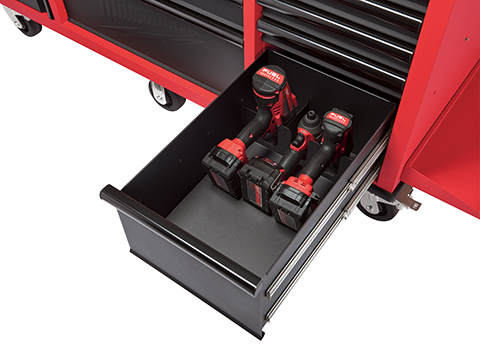 The mobile workbench also has the same features as the 30″ and 46″ storage tool chest and cabinet sets but with 11 drawers. 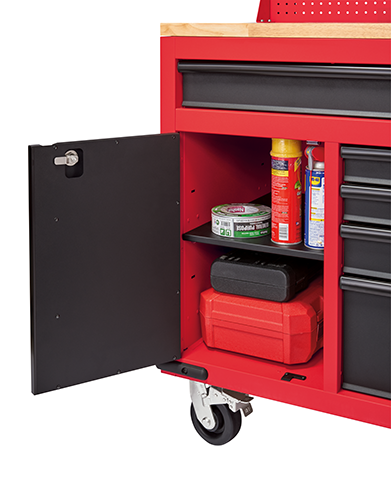 Unlike the other tool boxes, this mobile workbench also includes one cabinet door with it’s own lock and included shelf. 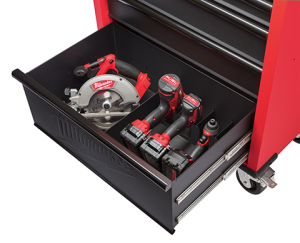 Milwaukee also added a built in quick access tool holder on the side of the work station to hold small hand tools like screwdrivers and ratchets and included an external shelf that can be position on the side of the work station. Also the wider 60″ stance of the mobile work station meant that they had to include an additional 2 casters in the center for a total of 6 casters. The 2 center casters are fixed while the 4 outer casters are 360 degree rotating casters allowing the mobile work station to make easy turns. 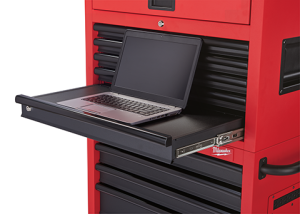 The 60″ mobile work station can support a max weight capacity of 2,200. These are available now and the price for the new 30″ steel storage chest and cabinet set 48-22-8530 is $499 and the price for the 60″ mobile work station 48-22-8560 is $699.